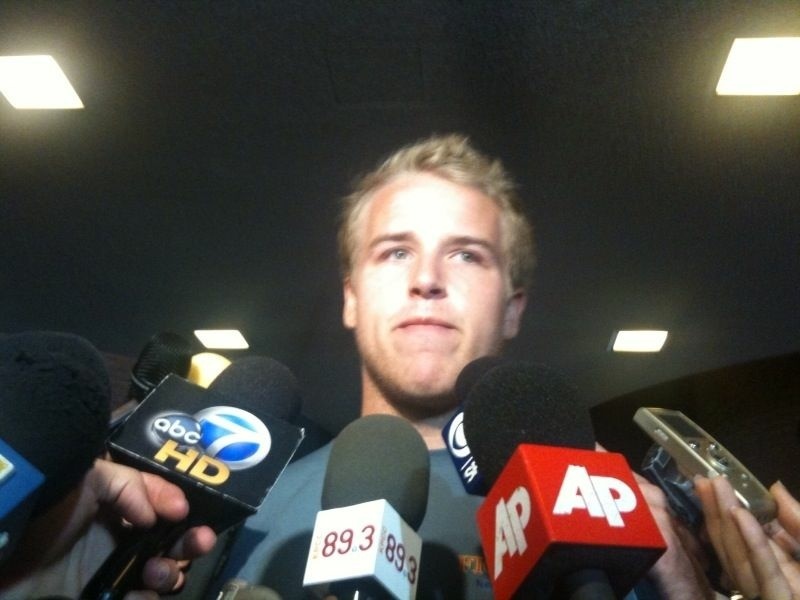 USC football quarterback Matt Barkley talks to reporters about the NCAA sanctions levied against the university's football and basketball programs, June 10, 2010. USC quarterback Matt Barkley says he wants to “finish what I’ve started,” so he’ll play football for the Trojans again next year. Barkley announced his decision at a televised news conference at USC’s Heritage Hall. Barkley will spend a lot of time on TV next year. The Trojans’ second game of the 2012 season is against Syracuse at the Meadowlands, perfect for New York TV appearances. His last regular season game next year is a primetime matchup with Notre Dame two days after Thanksgiving. By next December, Barkley could have a Heisman Trophy and a date for the national title game. He also figures to be the top quarterback in the 2013 NFL draft. Barkley isn’t the first quarterback to stay at USC when he could have turned pro. Seven years ago, Matt Leinart stuck around even after he’d won the Heisman Trophy. He led USC to a 12-and-0 record — until Texas beat the Trojans in the Rose Bowl. NCAA violations back in that 2005 season led to a two-year bowl game ban against USC that cost Barkley two chances to play for a national title. That ban is over now, but Barkley’s college football career isn’t. Not yet.